Non-small cell lung cancer (NSCLC) is the common type of lung cancer, which is the leading cause of cancer death throughout the world. Most patients were diagnosed too late for curative treatment. So, it is necessary to develop a minimal invasive method to identify NSCLC at an early stage. In recent years, cell-free circulating tumor DNA (ctDNA) has attracted increasing attention as a potential tumor marker for its minimal invasive, convenient, and easily accepted properties. The amount of ctDNA in plasma or serum was significantly higher in NSCLC patients than that in healthy controls or patients with benign diseases. 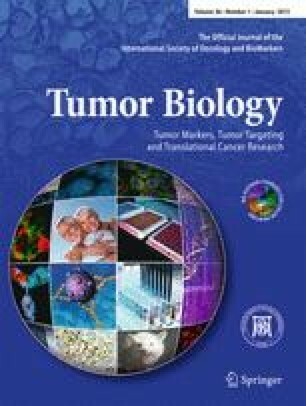 Furthermore, many studies have proved an association among tumor stage, tumor grade, lymph node involvement, the number of metastatic sites, tumor response, survival outcome, and the ctDNA levels. Many genetic changes, such as gene mutation, loss of heterozygosity, microsatellite instability, and gene methylation were also found in ctDNA in NSCLC patients. These findings demonstrated that the ctDNA could serve as a viable tool to monitor NSCLC and prompted us to find more sensitive and specific biomarkers for clinical practice, especially monitor these cases with at least one known gene abnormality. Here, we reviewed the evidence of ctDNA in NSCLC and consider possible future applications in patient management. This work was supported by the National Natural Science Foundation of China (no. 81202739). FDA approves Xalkori with companion diagnostic for a type of late-stage lung cancer. U.S. Food and Drug Administration.http://www.fda.gov/NewsEvents/Newsroom/PressAnnouncements/ucm269856.htm.